Congratulations! 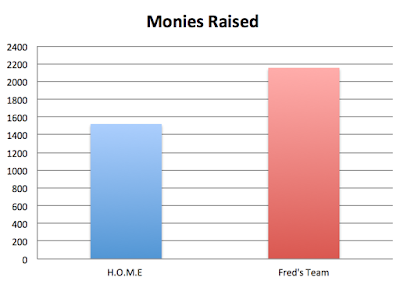 We raised over $3600 dollars for cancer research with Fred's Team and to support low income seniors with Housing Opportunities and Maintenance for the Elderly (H.O.M.E.). Thank you for your amazing support. If you'd like to donate you still can! Training for a marathon always seems like a long time. And then suddenly it is upon you and over. And you wonder where the summer went and how the days are cold and grey. This year was no exception. I trained more this year. My miles went up. I ran tempo runs and track repeats, long and short runs - really all the runs. I cut out the strong alcohols and tried to eat more consciously. I went to bed early. In short, I went all in. 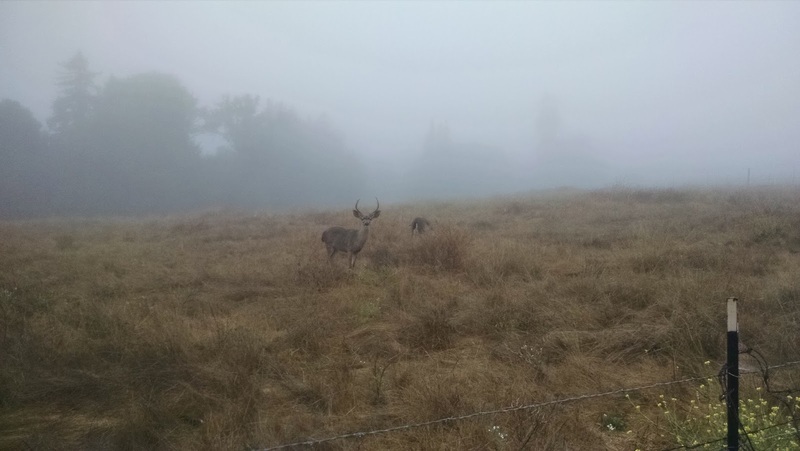 I ran in the rain in Portland, and past deer in Atlanta. I ran in a tiny town in Maryland. I ran on the sand on the Isle of Palms looking into Charleston and on old train tracks in Travelers Rest. I ran up the mountain in Santa Cruz and over cliff like streets in San Francisco. 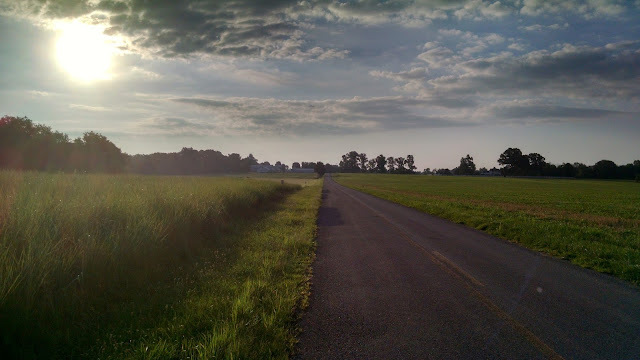 I ran in New Jersey and in Connecticut. But mostly I ran in Central Park. I ran the loop and the reservoir. I took the 72nd transverse and the 102nd. I did Harlem Hill every time. I loved the fast mile down to the lake. I tucked into Cat hill and made it. I ran past the horse carriages and the carousel. I ran through the tourists and the terrifying bicyclists. In all I logged right at 400 miles in Central Park. And I loved it. I was hoping to hit my goal this year, hoping that the work I put in would be enough. I ran the numbers and things looked good. But as every pollster will tell you, predicting the future is not a simple science. 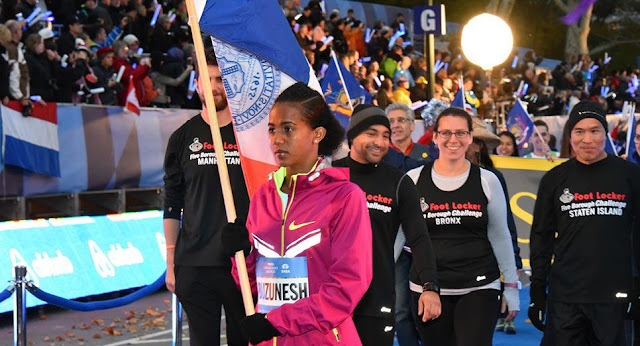 Found on the nycmarathon.org. I'm super famous and super in need of a haircut. It rained in Portland and then I, and a few thousand new friends, missed a turn. Who knows what time I would have had if I had not needed to run 26.7 miles to reach the finish line. I pushed too hard when I thought I was going slow at the beginning. Perhaps I would have found the energy to push harder at the end if the clock had been below four hours. Maybe I would have made it. Maybe. But the officially "corrected" time is 3:57. And five minutes is five minutes. Still, Portland, even in the rain, even with an extra half mile (uncorrected time of 4:01) was faster (by 12 seconds) than my Chicago time from last year. And that boded well for NYC. What did not bode well was that I spent three of the next four weeks sick. I managed to catch a stomach virus and then the flu in rapid succession. I eased up on the running regimen by not running at all. And Suddenly it was the morning of the NYC race. And I was waking up way before dawn. (It takes a stupidly long time to get to the start line. I love everything about the NYC marathon except getting to the start line.) I ate breakfast and double check that I had my watch and energy gels. I stepped out on the street and headed for the subway. It never came. I arrived five minutes before the subway was scheduled to arrive. It didn't. I waited 25 minutes for the next train. I would miss the Fred's Team breakfast. While I wanted to celebrate with friends and apply silly tattoos, I could handle this setback. But then the train stopped. We were held for unknown reasons. And then the tracks on my insides started rumbling. There was another train arriving fast and there was nothing good about this train. 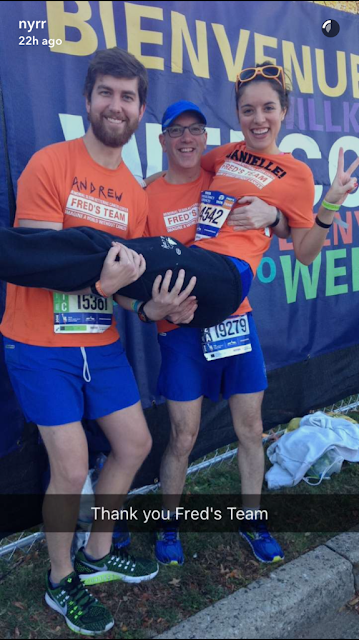 Danielle, David and I Even made it to NYRR's snapchat. Sweating drops of pain and agony I begged the train to move. I promised God the world if I could just make it to a bathroom. The train started, stopped another time, and finally made it down the line. The buses were to be outside of a hotel in Times Square. I didn't bring my phone as I didn't want to run with it, and I realized I had no clue of the name or location of the Hotel. I searched for the orange of our shirts. A few desperate blocks and I finally saw everyone gathering for the picture. But I would need to miss that too. I found a Fred's Teamer at the corner and asked her where the hotel was located. She asked "why?" Confused by her query I repeated my question "Where is the Hotel?" "Why?" she replied again. I barked with great urgency, "I need a bathroom!" And at 5:45am I just made it on to the bus. I had missed breakfast and the team picture but at least I wouldn't miss the race. The day could have started better. The day could have started much worse. I was assigned in a very fast starting group. I was wave 1C. There was only B and A in front of me. I noticed that I was standing with the 3:00 pacers and behind me was the 3:30 pacers. I do not know why I was in this group. We waited there for almost an hour. The cannon went off. The race started. I ran. Not knowing how sick I still was (leftover coughing and such) I aimed to start as if I was healthy. If the day went well I would have a shot at making my goal. If I turned out to be sicker than I thought then I would slow down. It was a plan. 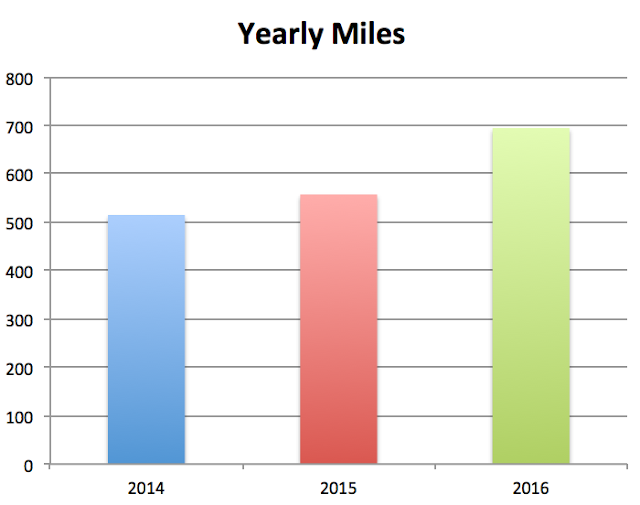 The first miles went well. I held myself to pace letting the speedy runners shoot past. I kept my desired 8:45 minute/mile pace for at least the first 15k-20k. But I new I was in trouble long before that mark. At mile four I felt like I was giving the same effort I had given at mile 20 in Portland. And well before I reached the halfway point I was trying to decide when I would start walking. Things were going down hill. I slowed but maintain a "running" style of movement until after I was to see some friends on 1st Avenue. I waved to A. and J. I took a shot of Beer with L. And then a few blocks up the road, and safely out of sight I started to walk. One of the hotter runs of the year. Made an emergency stop to drink out of a lawn sprinkler. I've never walked in a race before this marathon. I didn't know how to handle it mentally. I've never given up. And I am still wondering about the choice I made and how I made it and why. But in short I was tired and hurting and my skin was tingling all over and I felt sick. I walked and jogged and walked again. I made it to the Bronx and jogged a bit. And then back in Manhattan I started walking. At this point I finally realized I had to give up totally. And so I did. And I was marginally happier for it. I let go of all goals and started eating everything anyone was passing out. I enjoyed a huge handful of peanut m&ms, some very tasty Pringles, and a banana. I tried to take in the cheers, the sun and the happy crowd. But I also thought of everything and how I was walking and how disappointed I was. I thought of My Uncle Mac and how he encouraged people to find their passion. I wondered if it was time for me to find a new passion. I felt beat and tired. I was sorry I hadn't met my fundraising goal. I was sad because work was hard and life was hard and this stupid race was hard. And nothing was going to plan. I thought of Filipa. And I cried each time I saw her smile and knew it was gone. I planned to walk the long hill of 5th Avenue up and to Central Park. There I would jog the last two miles of the race. But my plan didn't hold. I was spotted by Lynn. With a ferocity incomparable, a love unrelenting, and a Scottish accent full of fire she jumped past a police officer and onto the road. She grabbed me by the arm. She screamed at me. She screamed for me to run. She pulled me forward. "I would give anything to switch places with you right now, to be right where you are! Run! Run! You are amazing! Run!" I ran up the hill and entered the park. With each step I moved faster. And then there was the finish line and I was across it and K. found me and walked me back to the Fred's team tent. Lynn started screaming at me in the middle of mile 24. I've never bombed in a marathon until now. Everyone that runs marathons has bad marathons. And now I do too. The next race will be better. Thank you all again for so graciously donating. You monies now given do make a difference. I have met people whose lives are changed for the better because HOME was able to provide them with a safe and clean home to live in. I have met people whose lives have been saved because of cancer research. I know they thank you too. Last days to donate! Please give generously to H.O.M.E. and Fred's Team! How to find the tracking app. Around mile 16-17 I'll be running on the east side of the road. I won't carry all the jelly. And I need three more energy gels. Where do I put my tattoos if I wear long sleeves? 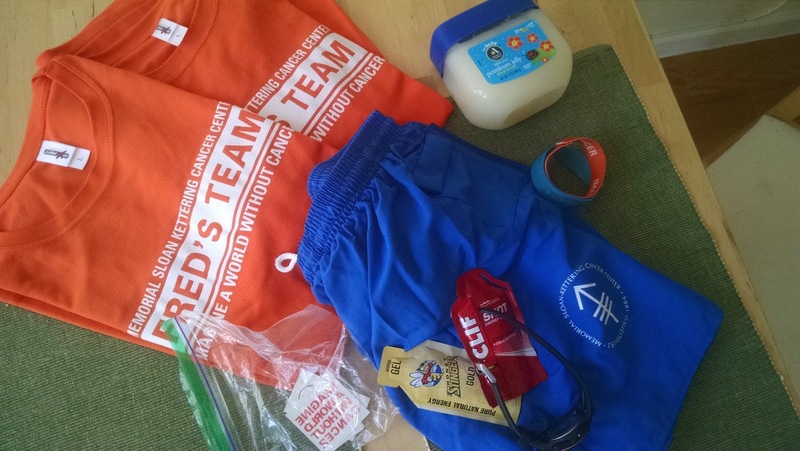 I'm headed to the Expo today to pick up my bib and a few other things including the sticker that will get me into the Fred's Team recovery tent at the end. I'm very excited. I missed the tent two years ago when I ran with Footlocker. The expo will be busy and chaotic, but there is nothing to be done about that. I just have to be brave. And then the marathon will be here and then even more quickly it will be over and the entire summer of training and eating and resting and all the blogging and monies will be put away. The sweaty runs, the freezing runs, the runs in Atlanta and Santa Cruz and the million laps of Central Park, the whole bit will be the past. I'm buying a bottle of scotch to celebrate. I'm thinking of the things I'll carry tomorrow. I need to set out my shorts and choose whether to wear long or short-sleeves. I know which pair of shorts to wear. I like the ones with the many small pockets. The small pockets keep things from flopping around. And the many pockets allow me to bring all the energy gel packets I want. But when it comes to running it is best to not carry too much. You can spot the new kids by their belts loaded with bottles filled with colorful liquids. Belts are complimented by handheld bottles with pockets for phones and batteries and more foods and whatever they could imagine they might need. Don't make that mistake. Run light. "Let us lay aside every weight..."
I hope that doesn't apply to the hopes and heartaches. I carry many. Everyone I know does. Some people write the names of lost loved ones on their shirts. It is pretty common when you support cancer research. I've never run a long race without thinking of those I love. I tend to get emotional when physically exhausted. This race may be especially difficult. 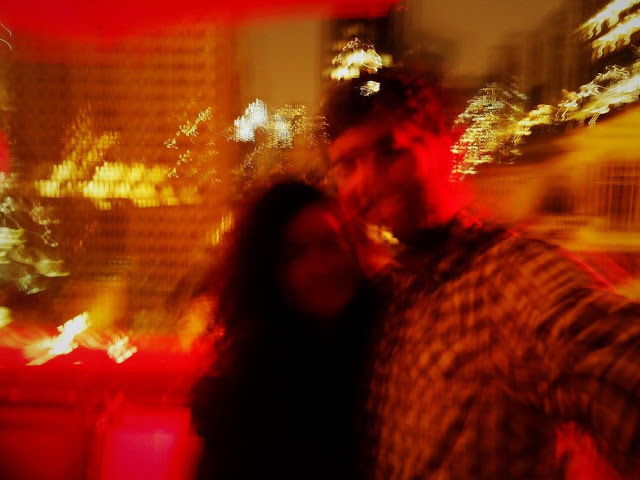 This week I've lost two friends, one last night. Everything hurts. Everything. I hate that it is normal to miss so many people. I hate that death is a part of life. I hate how life blends joy and sadness. I want to remember well, to honor well, to live well. But I don't know how. As always Uncle Mac, you are in my heart. May your joy for life become mine. Christopher, you are in my heart. Filipa, you are in my heart. It's back! This week, donation matching up to $250. Make your donation go twice as far. Donate today! Don't let it go to waste! Last week ever! I'm headed to the Parade of Nations tonight. Two years ago I was part of the parade because of Foot Locker and their Five Borough Challenge. Tonight Fred's Team invited me to join in. Two for two - not bad! 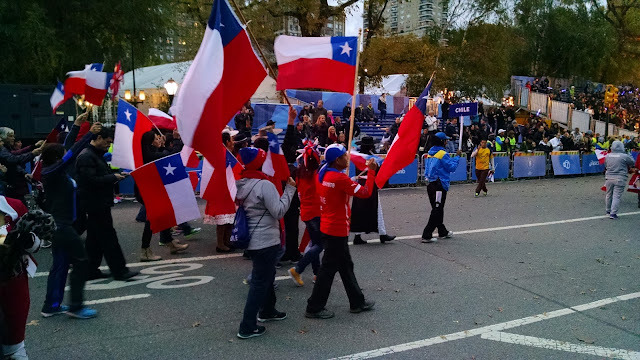 People pour into New York for the marathon from all over the world. To honor their dedication and the long flights taken, the marathon organizes a parade each year. Lots of smiling people waving, waving flags, and cheering: it is good for the soul. Can you see me?! I'm the one hiding behind the professional runner - who is carrying the New York City flag. 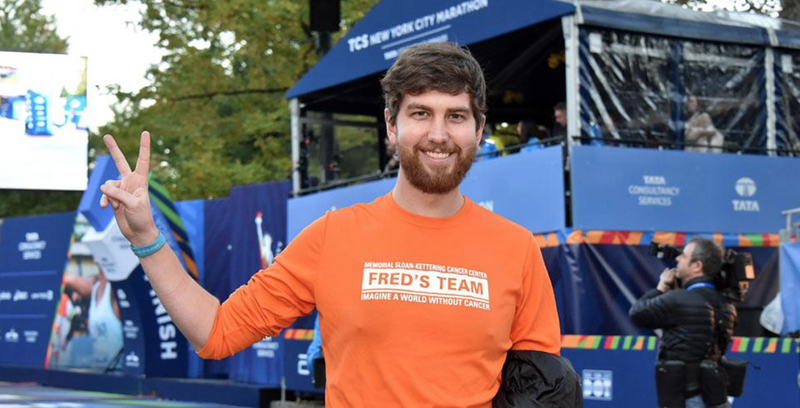 In addition to the many different countries there are representatives from different running clubs (Fred's Team being one of them), the city, and even some elite athletes. There is music and special cultural dances. There are fireworks. It is quite a show. I'll try to take lots of pictures tonight so I can show you tomorrow! 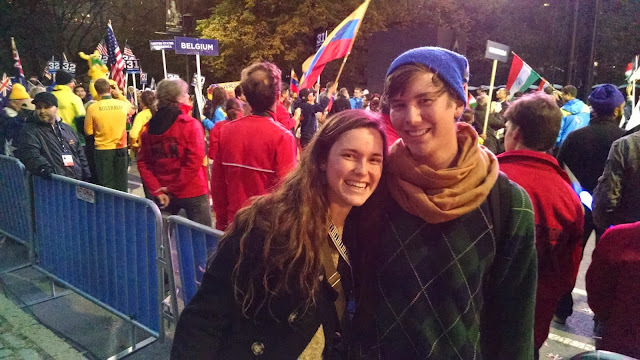 Check out these beautiful people that came to cheer me on! It's back! This week, donation matching up to $250. Make your donation go twice as far. Donate today! Don't let it go to waste! Wednesday health report: marginally stronger. Still lots of phlegm and general feelings of sickness. Summoning strength of will to make this my game 5. Call me Jordan, Michael Jordan. 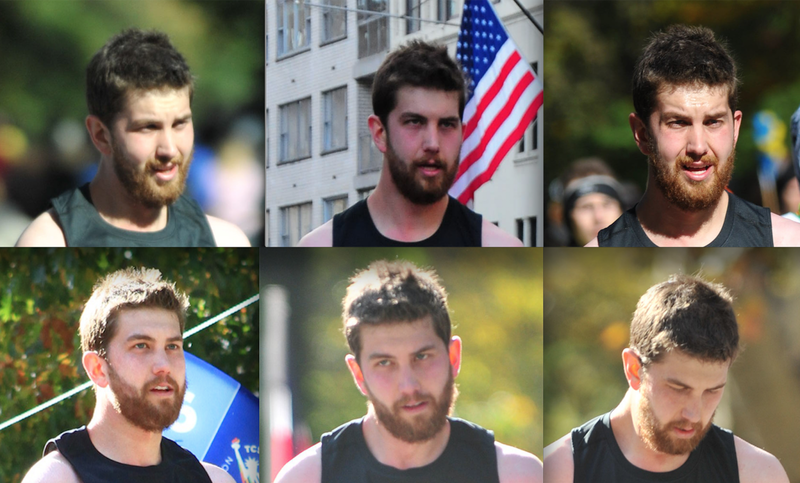 Everyone I know is posting glorious and victorious pictures of themselves running the marathon. Everyone looks fantastic and strong, and even happy. I wanted to get in on the action, but my New York city marathon photos are a bit less strong. Here is a collection of my race faces in no particular order. Top, L-R: Confused, Moment of Death, furrow of agony, 2nd row: post death, listing ship, and pain cave. This is the most majestic photo I could find. And it is completely staged. 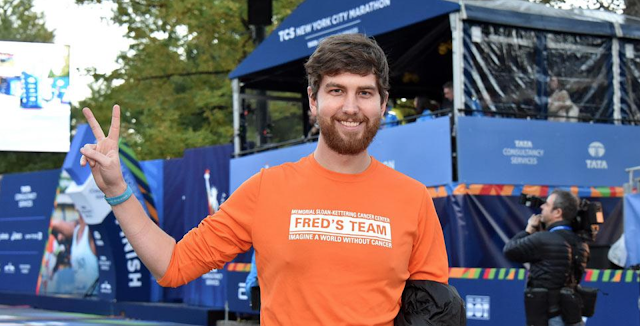 Fred's Team drills into you that you have to throw your hands up, smile, and look up at the finish line. We even ran the very end of the race multiple time just to know how to do it. In the moment of that photograph I wasn't able to respond to my own name, but at an instinctive level I pulled off the victory pose. Let me know where you will be (intersection and side) and I'll make sure to keep my eyes open for you! It's back! 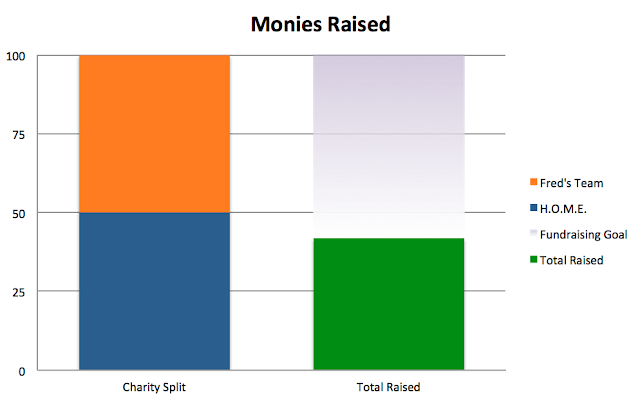 This week, donation matching up to $250. Make your donation go twice as far. Donate today! Don't forget to track my marathon progress on your phone! Especially if you are coming to see me run. This way you'll know roughly when I will arrive at your location. You won't need to stand outside for hours on end. In fact, if you plan it right it will just be a few minutes. That said, watching a marathon is pretty fun. So get out there early and cheer for a bunch of random strangers. At the moment I'm debating how much of this marathon I will run and how much I will jog/walk/slog. I'm still not completely over my cold from last week. My nose is a bit stuffed. I have a cough and I feel generally not great. I will be very disappointed if I have to take it easy this time. Or rather, there is no taking it easy in a marathon. I'll be disappointed if I have to exhaust myself for a really slow time. I've wanted to improve my time so badly. I put in the miles the stretching, the resting, and the eating, all to reach my goal. And then in Portland the heavy rain and the extra long course through me. And now a few ill-timed colds may do the same in New York. I suppose there is always next year. But I'd rather be able to give the race everything - and fail - than to not be able to try. Fortunately there are still a few more days to go. Needing extra encouragement I like looking back to happy times and things. The above photo is my first trip to Mt Hood. We camped overnight in this meadow on about 6-7 feet of snowpack. We played in the surrounding woods and as far up as we could get safely get on the mountain. I say "played" instead of hike because trail markers must have been too expensive. If we were ever on any trail it was by accident. Fortunately, the mountain provided a pretty good frame of reference. 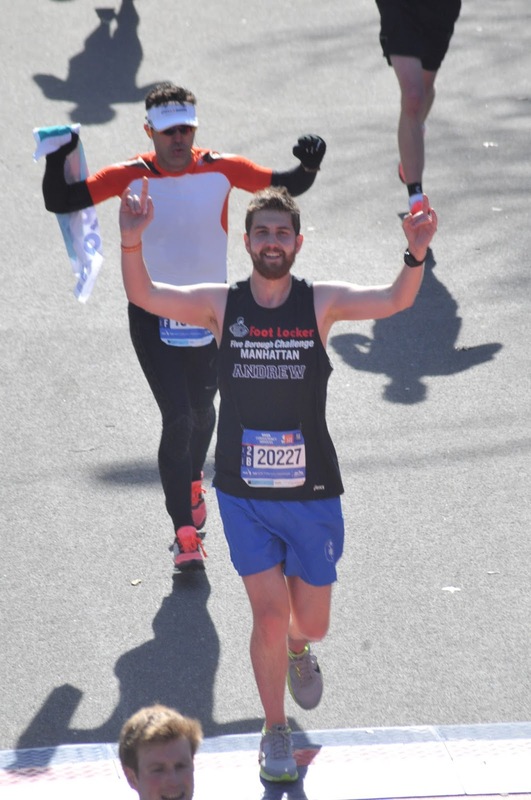 And this of course was the 2014 NYC marathon. I wasn't sick, but I was freezing! This is from pretty early in the race. You can tell because I'm smiling. My little Portland tree is showing signs of new life. At the end of some shoots is the yellow green of new needles. It has a way to go before reaching full size ~230ft tall. I'll need a bigger pot. That is really only a guess at full size. And "full size" may not be a helpful concept anyway. That was the height of the tallest tree known and reliably measured before we killed it. It seems like that is the way of it for many trees. The west is the home to some very long lived tree species. Trees that have lived thousands of years are still standing. I wonder how long they can live. I wonder if some trees are actually immortal. Baring a destructive fire, strong winds and zealous loggers are some trees intrinsically immortal? It's a hard thing to test. It takes quite a while. 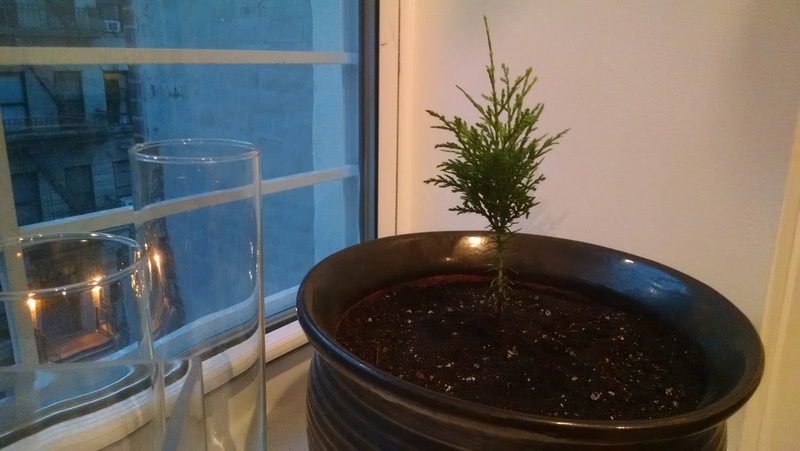 Anyway, my little tree has been with me for a month. And given the color of my thumb this little guy is facing a long uphill road. The oddest marathon trophy - but my favorite. The last week is upon us. Next Sunday morning I'll be getting up early (even with the extra hour) and heading south to Staten Island to find my place in the starting line. 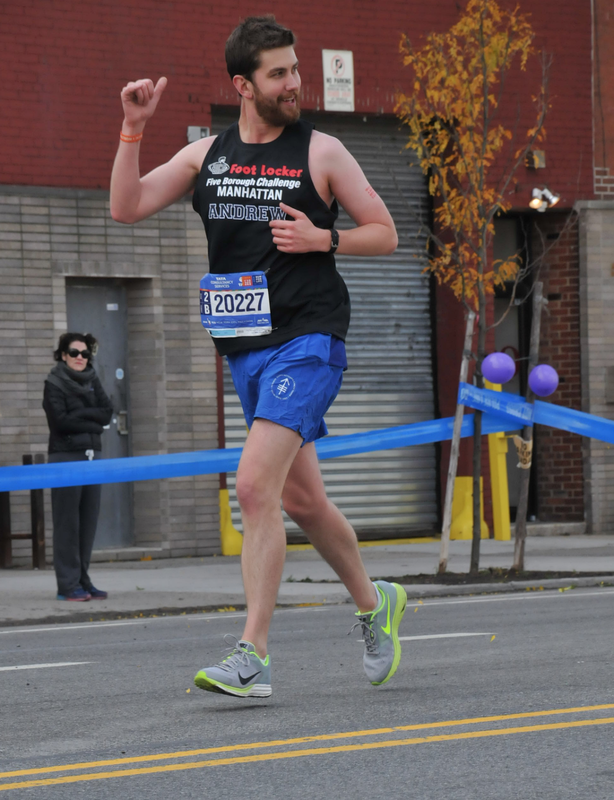 Next week is the NYC marathon. I am excited. I know you are too. 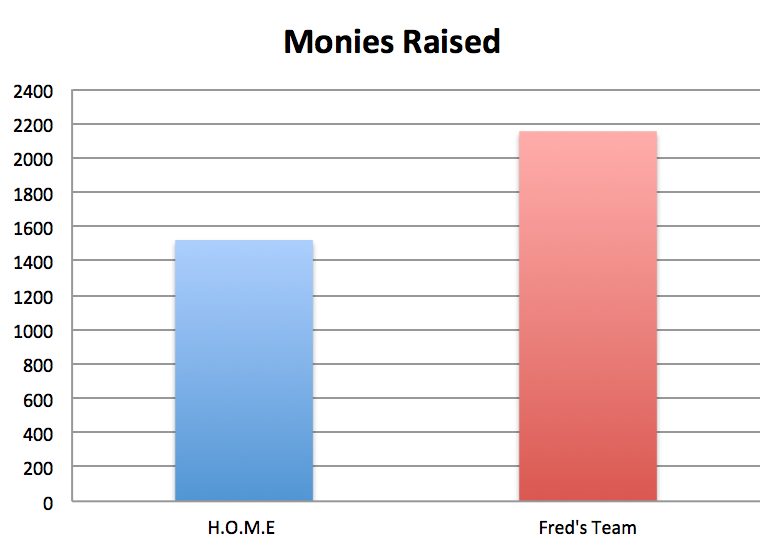 We have one more week to raise monies for HOME and Fred's Team. I hope you can help make a big difference! Donate right now. Oh, and I have another anonymous donor who has put up $250 dollars this week. For every dollar you give (to either HOME or Fred's Team) this person will give a dollar to Fred's Team. So donate like wild. We might not be able to make my lofty goal, but I hope we can do a bit better than this. I believe in you! 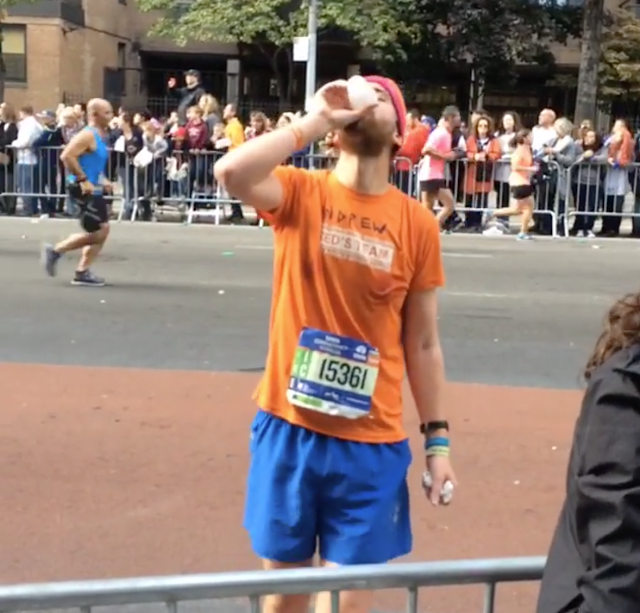 OK, monies aside - Its time we talked about my "between the marathons" training plan. It was pretty sweet. I found a great plan to fit my needs. Pretty easy "maintain" strategy. Blue days are long gone. But I should remind you that a plan is only a plan. And in my case was it was only a fevered plan. A week after the Portland marathon I came down with a fever and some lower intestinal issues that rocked me for more than a few days. In response I took a few unscheduled rest days. And then last week I was knocked out of the game with a new fever. Again, everything inside wanted outside, but this time its preferred route was through my eyes and nose. In response I took a few more unscheduled rest days. And just as I was returning to health (but with a stuffed up nose) I cooked up some rather suspect chicken and found myself with another bout of lower intestinal excitement. Rest Rest and Rest. So there you have it. The Andrew Lawton Between the Marathons Training Plan: diarrhea, flu, and rotten chicken. I'm sure it's about to catch on. I will pick up my bib this week and plenty of free samples at the expo this week. So stay tuned for sweet pictures. Also I'll be giving out my bib number and all the information needed to track me live. If you can make it to see me run, please let me know what block (and side of the street) so that I can make sure to look for you!